An inferno engulfed the Los Angeles region Wednesday, forcing more than 200,000 people to flee and threatening thousands of homes, including the luxurious Bel-Air neighborhood dotted with mansions. Authorities issued a "purple" alert -- never used before -- because of the extreme danger with winds that could reach 80 miles an hour (128 kilometers an hour), severely limiting firefighting efforts. "Yesterday it was further north, but this morning we woke up and it was east of us," said Los Angeles resident Patricia Moore, 84, loading belongings into the trunk of her car. "We heard the fire engines before six o'clock this morning, and we said, 'Maybe we should start getting our stuff into the car.'" The flames have swallowed about 80,000 acres (32,000 hectares) in just over a day since the "Thomas" fire, currently the state's largest, broke out, leaving at least one dead in an area about 45 minutes from downtown LA. High winds caused another wave of wildfires to erupt overnight Tuesday, including one in Los Angeles' affluent Bel-Air neighborhood. The area battled gridlocked traffic as residents fled ash and smoke that churned over the smoldering hillside in the United States' second-largest city. Fire crews worked to save those homes threatened by the flames. Los Angeles Mayor Eric Garcetti said more than 230,000 people had been forced from their homes in Los Angeles and Ventura counties. "Very strong winds" blowing from the northeast to the southwest were causing the fire to balloon, he said, warning Angelenos to be ready to flee at a moment's notice. In Bel-Air, that's exactly what they did. 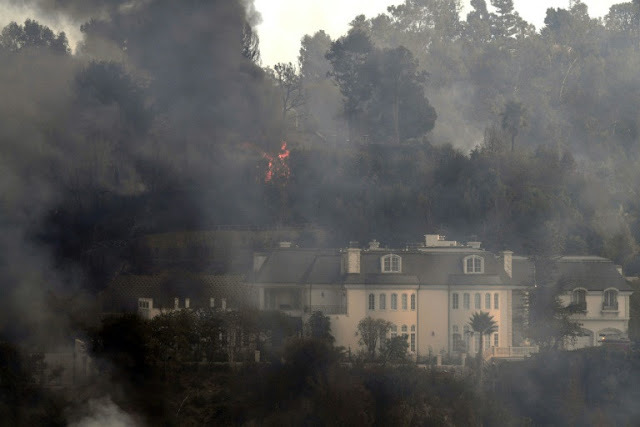 The "Skirball" fire ignited before 5:00 am (1300 GMT) and quickly grew to engulf about 150 acres around the district, home to celebrities and billionaires including Elon Musk and pop superstar Beyonce. Police knocked on doors and used loudspeakers to make sure everybody left their mansions. "They told even us to leave," one of the officers said. Forecasters predicted that winds could cause further spreading, threatening more upscale homes and the acclaimed Getty Center museum. The "Skirball" fire -- near a cultural center of the same name -- also prompted authorities to close the 405 Freeway, a major commuting corridor. Residents of wealthy LA neighborhoods between Mulholland Drive to the north and Sunset Boulevard to the south were part of the evacuation zone. A cloud of black smoke was creeping across the city with a large, dark column rising into the air, leaving authorities concerned about the air that was unbreathable in some places. "We're encouraging people not to exercise outside. Don't go outside if you are sensitive," Garcetti said. The acclaimed Getty arts institution -- home to masterpieces including those by Edouard Manet -- was closed until at least Thursday. Museum authorities tweeted that "air filtration systems are protecting the galleries from smoke." The prestigious University of California, Los Angeles is near the same area and ended up evacuating, after students began the day wearing masks. Dozens of schools were closed, as was Santa Monica College. Just north in Ventura County the "Thomas" blaze continued unabated, after erupting in the hills of oak and scrub north of Santa Paula, powered by strong seasonal guests known as Santa Ana winds. Fire departments from across the state had arrived to help battle the ferocious wildfires. Authorities warned that winds will likely remain strong until Friday. Firefighters were also on the scene of the "Rye" fire -- which had grown to 7,000 acres in the Santa Clarita area -- as well as the "Creek" fire north of downtown Los Angeles that had grown to more than 11,000 acres. California Governor Jerry Brown declared a state of emergency over the area on Tuesday. "This fire is very dangerous and spreading rapidly," he announced. "It's critical residents stay ready and evacuate immediately if told to do so." The Federal Emergency Management Agency (FEMA) said it had released funds for relief services. US President Donald Trump tweeted a message of "thoughts and prayers" to California as it nears the end of its deadliest year ever for wildfires. 0 Response to "Luxury LA mansions threatened as fierce California wildfires rage"